Features: Cooper screw back clip earring findings. 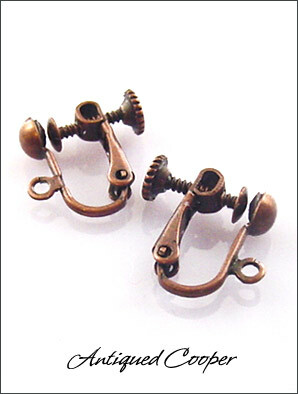 Antiqued copper toned, these clip earring findings are outstanding to make your own or repair/fix a pair of antiqued copper earrings while keeping the same metal hue. Screw backs clip findings allow you to control the tension to the earlobe. Hinged mechanism makes them easier to open and close.